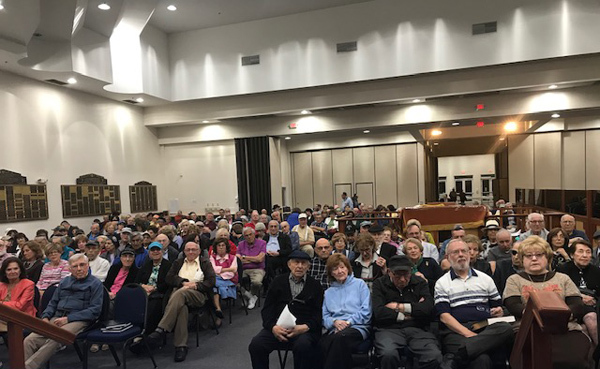 From Jan. 3 to Jan. 9, 2019, the Rabbi Isaac Elchanan Theological Seminary (RIETS) sponsored a “Winter Week of Learning” at the Young Israel of Deerfield Beach in Deerfield Beach, Florida. 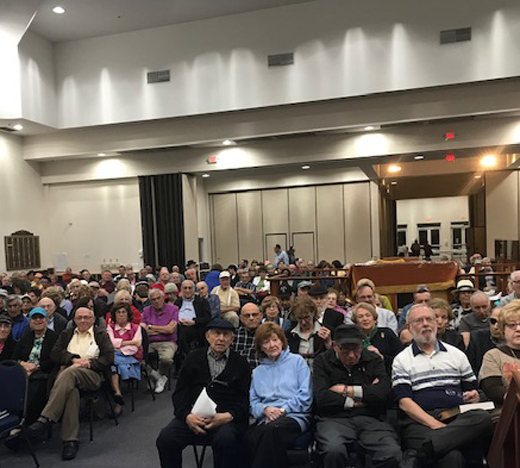 The series of lectures and events, titled “Praying with Purpose in the 21st Century,” was organized by Rabbi Zev Goldberg of RIETS and a host committee of some 25 individuals and couples from Deerfield Beach. Additional support came from Yaffa and Bert Schonbach and Nathan and Tami Braun; Irving Waxman, who sponsored portions of the event as part of the lecture series in memory of his wife; and a gift to RIETS from the Sam Gossel Foundation. Hundreds came together for this inspiring week of learning and sharing, many of whom were alumni, parents of alumni or grandparents of alumni. Other items on the program included offerings by Shua Katz, Josh Kaufman, Menachum Polack, Rabbi Yitzchak Radner and Noah Shapiro, students in the Marcos and Adina Katz Kollel; a guest lecture by David Gordon; and a closing panel discussion, “The Unique Challenges of Prayer in Today’s World,” including Rabbi Yisroel Edelman, Rabbi Yaakov Gibber and Rabbi Efrem Goldberg, moderated by Rabbi Yaakov Glasser, The David Mitzner Dean of the Yeshiva University Center for the Jewish Future. Rabbi Penner was overjoyed by the success of the event, inspired by “so much wonderful energy and desire to learn” as well as the hospitality and generosity of the congregation, many of whom hosted meals throughout the week for the participants.